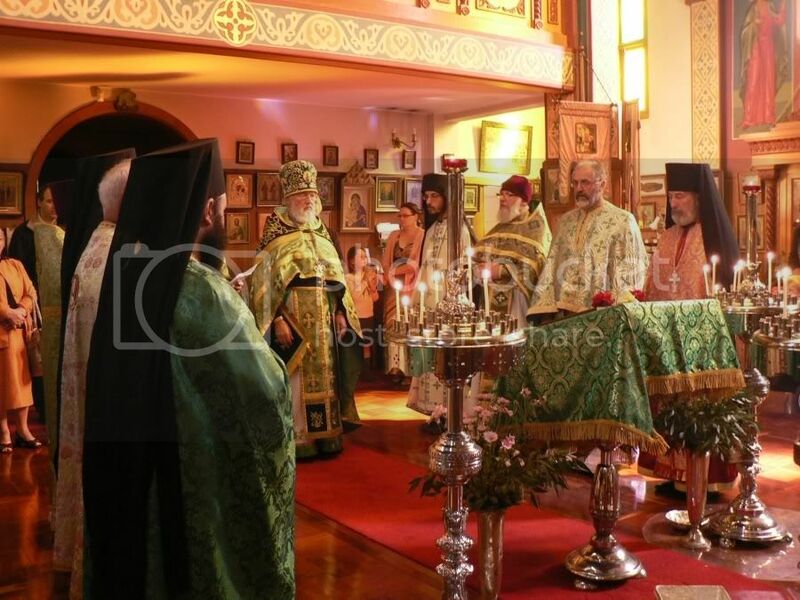 The Saint Patrick Orthodox Mission celebrated its first feast day on Saturday 2 April (n.s.) at Saint Nicholas Russian Orthodox Church, Wayville. 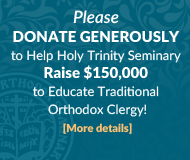 It was with a spirit of great joy and thanksgiving that worshippers gathered for Matins on the Friday evening, and again to celebrate the Holy Mysteries at the Divine Liturgy on the Saturday morning. 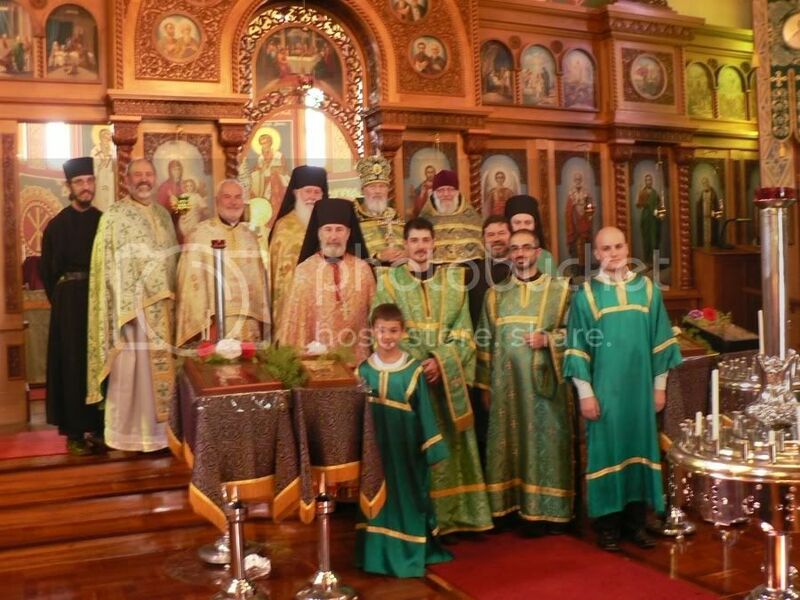 The Divine Liturgy was concelebrated by the Vicar General of the Australian and New Zealand Diocese, the Very Rev. Mitred Archpriest Michael Protopopov, together with: Archpriest Vladimir Deduhin, Rector of Saint Nicholas Church; Abbot Benjamin and Hieromonk Nicholas from the Prophet Elias Monastery, Monarto; Archimandrite Silouan from the Greek Orthodox Monastery of Saint Nektarios, Croydon; Father Nicolas Haddad from Saint Elias Antiochian Orthodox Church; Hieromonk Kyril and Deacon Emil Mishriky from Holy Ascension Orthodox Mission, East Brunswick, Victoria; Father Barnabas Jellings and Deacon Daniel Jellings from Saint Elizabeth the New Martyr Mission, O’Halloran Hill; and Father Peter Hill, Rector of Saint Patrick Mission. In addressing the congregation, Father Michael spoke of the Mission as a new candle light of the fullness of Orthodoxy reaching out to the Adelaide community. His words and the impressive gathering of clergy had a deep effect upon the prayerful congregation and gave fresh encouragement to the members of the Mission to face the challenges of establishing this new work. Following Divine Liturgy the clergy and about fifty guests enjoyed a wonderful Lenten buffet prepared by the ladies of the Mission. Greetings were received from a number of individuals and congregations, including from the Protection of the Most Holy Mother of God Cathedral, East Brunswick, which kindly donated some servers’ sticharions for use by the Mission. Saint Patrick Orthodox Mission grew out of the English-language Liturgy served by Father Peter at Saint Nicholas Church since 2005. It was formally established by an ukase of His Eminence Metropolitan Hilarion, First Hierarch of the Russian Church Abroad, dated 23 November 2010 (n.s.). It has just entered into a rental arrangement for the former St Swithun’s Anglican Church property at 131a Morphett Road, Morphettville, and the first Vigil and Liturgy will be served there on the Fifth Sunday of Great Lent. Further details about the Mission can be found on its website: stpatrickrocor.com. The prayers of all the faithful are sought for the ongoing establishment and development of this new work.